Today, Aspen’s riches come from the ski industry — but they used to come from silver mining. Aspen was founded in 1879, during the glory days of Colorado silver mining — the same era when mining boomtowns like Leadville and Georgetown were being established. With seemingly endless amounts of silver in the nearby Elk and Sawatch mountains, Aspen thrived until 1893, when economic disaster struck. That year, Congress repealed the Sherman Silver Purchase Act, under which the federal government had purchased millions of ounces of silver for coinage. Without a market for the silver, Aspen and the other boomtowns nearly became ghost towns. Despite a steady decline in population, and area mines and railroads going bankrupt, Aspen managed to survive — but it needed something to sustain it. Tourism, and the newly fashionable sport of skiing, became the answer. In 1924, the Independence Pass Highway was completed, making travel to Aspen easier. Then, in 1936, Aspen’s first ski lodge was opened, ushering in the industry that would give rebirth to the town. Ski enthusiasts and wealthy vacationers descended on Aspen. In 1946, the area’s first chairlift opened, the longest in the world at the time, according to an article in the Colorado Encyclopedia. 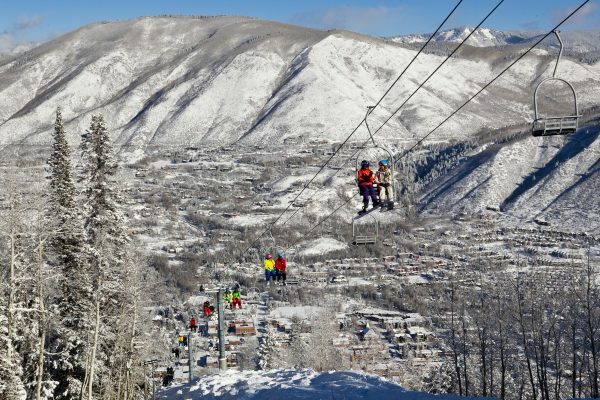 New ski resorts opened, and Aspen continued to thrive. It wasn’t just skiing that made Aspen famous, however. It became known as a center for arts and culture, hosting such notable events as the Aspen Music Festival, the International Design Conference, and the Aspen Institute. Today, Aspen is known as a playground for celebrities, with some of the most expensive real estate in the United States — a far cry from the Silver Crash days. You can read more about Aspen in numerous publications from our library; many are available online. In 1958, William Wardell wrote a delightful article in the Colorado Historical Society’s Colorado Magazine, sharing his memories of childhood in Aspen before the Silver Crash. 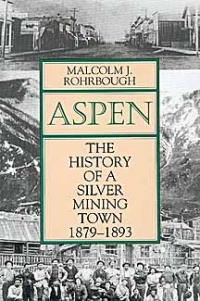 You can also read about Aspen during the mining years in Aspen: The History of a Silver Mining Town, 1879-1893, which is available for checkout. The University’s Institute of Arctic and Alpine Research also published several studies on Aspen environmental issues, including Quality Skiing at Aspen, Colorado (1975) and Landslides Near Aspen, Colorado (1976). Other historical resources on Aspen available from our library include highway studies, air quality studies, a 1965 report on the Aspen general area plan, and, more recently, Climate Change and Aspen from 2006. Search our online catalog for titles. Finally, be sure to check out the Aspen Historical Society’s website for a historical timeline, digital archives, and more.